ایران به عنوان یکی از مراکز مهم پراکنش گونه‌‌های دارویی از جمله گیاه زعفران ( (Crocus sativus L.است. وجود یا عدم وجود تنوع ژنتیکی در ارقام بومی و تجاری رایج زعفران کشور همواره یکی از سؤالات مهم محققین این زمینه بوده است. در مطالعه حاضر، نمونه‌های مختلف زعفران از مناطق مختلف ایران شامل 17 نمونه زراعی از استان‌های خراسان شمالی، خراسان رضوی، خراسان جنوبی، لرستان و ایلام، 8 نمونه وحشی (C. haussknechtii) از استان‌های لرستان، کرمانشاه و ایلام و 1 نمونه وحشی (C. cancellatuse) از استان کرمانشاه جمع‌آوری و سپس تنوع ژنتیکی آنها با استفاده از مارکر مولکولی RAPD مورد بررسی قرار گرفت. تعداد 8 آغازگر در مجموع 113 قطعه چند شکل با میانگین 13/14 قطعه تکثیر نمودند که بیشترین تعداد آلل مربوط به آغازگر 340Oligo بود. درصد چندشکلی نیز 77/73 محاسبه شد. تجزیه خوشه‌ای با استفاده از الگوریتم UPGMA، نمونه‌ها را به 4 گروه تقسیم نمود. در این گروه‌بندی کمترین فاصله میان جمعیت‌های زعفران جمع‌آوری شده از استان‌های کرمانشاه و ایلام وجود داشت، به عبارت دیگر این دو جمعیت بیشترین شباهت ژنتیکی را با یکدیگر داشتند. بیشترین شباهت بین نمونه‌های جمع‌آوری شده از صالح آباد و لومار در استان ایلام و کمترین شباهت بین اکوتیپ‌های جمع‌آوری شده از بیستون در استان کرمانشاه و تربت‌جام در استان خراسان رضوی مشاهده شد. در بیشتر موارد نمونه‌های گونه‌های مختلف در گروه‌های متفاوتی قرار گرفتند که می‌توان گفت این جنس از تنوع بالایی برخوردار است. ولی به دلیل اینکه در مواردی نمونه های یک گونه وحشی (C. haussknechtii) با گونه زراعی زعفران در یک گروه قرار گرفتند، نتیجه گیری می‌گردد که هنوز وجوه مشترک زیادی در سطح مولکولی بین این گونه‌ها وجود دارد که حکایت از یک پیشینه ژنتیکی مشترک دارد. 3Assistant Professor of Plant Production Department, Saffron Institute, Torbat Heydarieh University, Iran. Iran is one of the important distribution centers of medicinal species, including plant saffron (Crocus sativus L.). The presence or absence of genetic diversity in common native and commercial cultivars of saffron of the country has always been one of the important questions for researchers of this filed. In the present study, varioussaffronsamplesfrom different regions of Iran, including seventeen cultivated samplesfrom North Khorasan, Khorasan Razavi, South Khorasan, Lorestan and Ilam, eight wild types (C. haussknechtii) from Lorestan, Kermanshah and Ilam and one wild type (C. cancellatuse) from Kermanshah were collected and then their genetic diversity was obtained using random amplified polymorphism DNA (RAPD) marker. A total number of 161 DNA bands were produced by eight primers with an average of 14.3 bands; the primer Oligo 340 produced the most number of bands. The polymorphism percentage mean was 73.77%. Cluster analysis using UPGMA method divided the samplesinto four groups. In this grouping, there was a minimum distance between saffron populations collected from Kermanshah and Ilam. In other words, these two populations had the maximum genetic similarity with each other. The maximum similarity was observed between the samplescollected from Saleh-Abad and Lomar in Ilam and the minimum similarity was observed between ecotypes collected from Bisotoon in Kermanshah and Torbat-jam in the Khorasan Razavi province. In most cases, samples of different species were divided into different groups such that it can be said that this Genus has a great diversity. Although there are some samples of wild species (C. haussknechtii) that were with saffron crop species in a group in which there exists many molecular Genetics similarities between these species that is indicative of a common genetic background. Aabedi, Z., Shekarpoor, M., Kalantari, S., and Salami, A. 2012. Molecular variation in some Iranian saffron (Crocus sativus L.) accessions using RAPD marker. In the Third Iranian Agricultural Biotechnology Conference (Plant, animal and industrial), Mashhad, Iran. 3-5 September 2012, p 91-96. (In Persian). Alavi-Kia, S.S., Mohammadi, S.A., Aharizad, S., and Moghaddam, M. 2008. Analysis of genetic diversity and phylogenetic relationships in Crocus genus of Iran using inter-retrotransposon amplified polymorphism. Biotechnology and Biotechnological Equipment 22 (3): 795-800. Beiki, A.H., Abaspoor, N., and Mozafari, J. 2013. Genetic diversity of cultivated and wild Crocus genus in Iran with ISSR markers. Journal of Molecular and Cellular (Iranian Journal of Biology) 26 (2): 164-173. (In Persian with English Summary). Dalby, A. 2003. Food in the Ancient World from A to Z. Routledge Press, London. Beiki, A.H., Keifi, F., and Mozafari, J. 2010. Genetic Differentiation of Crocus Species by Random Amplified Polymorphic DNA. Genetic Engineering and Biotechnology Journal 18: 1-18. Doyle, J.J., and Doyle, J.L. 1987. A rapid DNA isolation procedure for small quantities of fresh leaf tissue. Phytochemical Bulletin 19: 11-15. Ebrahimi, A., Naghavi, M. R., Sabokdast, M., and Mardi, M. 2010. Assessment of genetic diversity in accessions of two barely species (H. vulgare L. and H. spontaneum L.) using SSR markers. Iranian Journal of Crop Sciences 12 (3): 333-345. (In Persian with English Summary). Erol, O., Kaya, H.B., Sik, L., Tuna, M., Can, L., and Tanyolac, M.B. 2014. The genus Crocus, series Crocus (Iridaceae) in Turkey and East Aegean islands: a genetic approach. Turkish Journal of Biology 38:48-62. Fakhr tabatabaii, M., Maleki, M., Rahimi nezhad, M., Atri, M., Naghavi, M., Mardi, M., Pirseiedi, S.M., Mir masoomi, M., and Novjavan, M. 2009. Efficiency of floristic, phytochemical and molecular markers to determine diversity in Iranian populations of Triticum boeoticum. 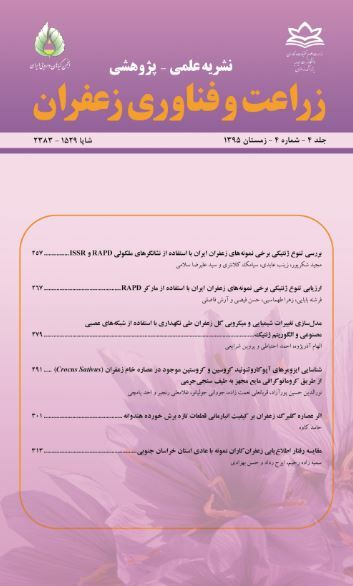 Iranian Journal of Biology 21(5): 806-816. (In Persian with English Summary). Fernandez, J.A. 2004. Biology, biotechnology and biomedicine of saffron. Plant Science 2: 127- 159. Jafari, H., and Najafi zarini, H. 2012. Evaluation of phylogenetic relationships of Crocusspecies using protein profiles. Journal of Crop Breeding 5 (11): 25-33. (In Persian with English Summary). Javid, I.M., Nazeer, A., Mudasir, H., Taseem, A.M., Sajad, H., Shoiab, B., Asif, A., and Raies, A. 2015. Molecular characterization of saffron-potential candidates for crop improvement. Notulae Scientia Biologicae 7 (1): 81-89. Kafi, M. 2002. Saffron Production and Processing. Ferdowsi University Press, Iran. (In Persian). Mathew, B. 1982. The Crocus: a Revision of the Genus Crocus (Iridaceae). Batsford, B. T. Ltd., London. Najafy, A., Ashrafi Parchin, R., and Farshadfar, E. 2011. Evaluation of genetic diversity in wheat cultivars and breeding lines using Inter Simple Sequence Repeat markers. Biotechnol and Biotechnol 25 (4): 2634-2638. Namayandeh, A., Nemati, Z., Kamelmanesh, M.M., Mokhtari, M., and Mardi, M. 2012. Genetic relationships among species of Iranian Crocus (Crocus spp.). Crop Breeding Journal 3 (1): 61-67. Saboora, A., Rajabian, T., Abrishamchi, P., and Ebrahimzadeh, H. 2003. Phonetic studies by SDS-PAGE and PAGE analysis of corn proteins in Iranian Crocus species and populations. In 1st International Symposium on Saffron Biology and Biotechnology, Albacete, Spanish, 22-25 October 2003, p. 51-55. Sajadi, S.M. 2006. Study of problems of production and export of saffron and solutions. Journal of Student's 9: 55-64. (In Persian). Schaal, B.A., Leverich, W.J., and Rogstad, S.H. 1991. Comparison of Methods for Assessing Genetic Variation in Plant Conservation Biology. In: Falk, D.A. and Holsinger, K.E. (Eds), Genetics and Conservation of Rare plant. Oxford University Press, New York. p.123-134.